Classic, color blocked and convertible. This Tory Burch crossbody bag crafted of polished pebble leather is the ideal for day-to-night style. 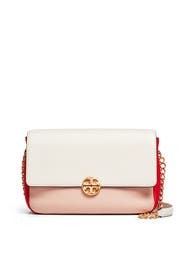 Pink and ivory colorblocked leather crossbody with gold plated Tory front logo. Foldover top with magnetic snap closure. 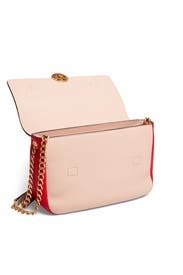 1 exterior pocket, 1 interior slit pocket, and 1 interior zipper pocket. Adjustable leather and chain strap with 22.5" drop. 6.4"H x 9.6"L x 2.6"D.